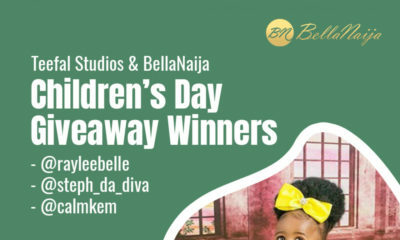 The BellaNaija Living & Teefal Studios Children's Day Giveaway! ?? 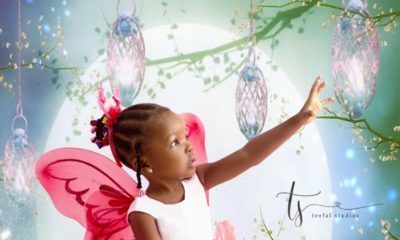 It’s Children’s Day and BellaNaija Living wants to celebrate your awesome children with this photoshoot giveaway in partnership with Teefal Studios. 3 parents will get a chance to win an individual photoshoot for one of their children. Kids do say the funniest things sometimes so leave a comment on this post with something funny your child did or said OR one funny story you have about your parenting experience. Each comment must have a Learning Point after your funny story, let’s all learn from each other on how to raise tomorrow’s leaders. Include your name, your child’s name and your Instagram handle. The giveaway is open for 1 week; 27th of May – 3rd of June. The 3 winners will be announced on the 4th of June. Only one entry per child/parent is allowed. This Sunday I woke up late, rushed my Nanny and baby to have a bath and get ready for church. We achieved that I record time 30mins and I felt I was good to go. My 19month old wanted to keep watching carton but I switched off the tv and off we went. I had just driven past our estate gate when my Nanny said… Aunty we have to go back . Am like for what , we are late and she says ” baby has popped and it’s so watery that it seeped out from his diaper, stained his short and shirt and also stained her dress. Chai… I was angry and speechless. On getting back home and climbing the stairs my son was laughing at my angry face. I couldn’t help but smile… In my mind we got ready on time now this. With children you should be ready for the unexpected and be patient… No amount of vex will make you kill your child so why vex. Lol. My daughter is an amazing 3years going on 4. She is very smart, lovable, adorable and vocal. One experience i hold dear was i was alone in the house and unknowingly she is back from an outing with her aunties. She rushed into the house while i was dressing up and she screamed…..’Daddy, close your bumbum’. and for a while, i was shocked. What i have noticed is, most times we correct our children and they also demand we live by examples. God would help us. My name is Wale @waleshammahh, my daughter is Ibukunoluwa! My Amazing Son is a 15months. Before he turned One, each day came with a lesson for me as a mother. The first time his father bought him A ball to keep he busy, they played together with the ball that day. My husband repeatedly said ‘goal’ and ‘a goal’ while they were playing. Fast Forward to the part where we all slept at night, I was in a deep sleep when I heard ‘A goal’ (in an infant’s voice, my child hadn’t started to pronounce words at this time so I wasn’t quick to think he was the one). To My greatest Shock when I opened my eyes It was my Boy Saying ‘A goal’ at about 3:30 am in the early hours of the morning. He eyes were still sleepy and he still kept saying ‘A goal’ till I put him to sleep again. On one occasion I Walked into the room and saw my 12month old (at the time) diligently and seriously ironing the floor like his next meal depended on it (thankfully there no Light and the iron wasn’t even plugged). I was amazed and amused at the same time because I wouldn’t have figured that he was mature enough to grasp little things. On another Occasion, it was the cotton bud he was attempting to clean his ear with all by himself. In raising tomorrow’s leaders, we should be careful about things we say and do in their presence. they have been sent to earth with very high IQ. Let them see things we want them to imitate and portray, tell them the right things, speak the right words around them. If a parent keeps saying ‘You are stupid’ to a child, the child will take in these words, sonner or later these words will just proceed out of your child’s mouth with free cause and unhindered. See training a child as Garbage in, Garbage out, wrong values with only dish out wrong and even worse values because they will have to do these wrong things better than you. We all have to be guided. My son’s name is Ireoluwamide Sonaike. He is a very smart, handsome, strong and ever smiling boy. One funny thing he does is, if you caution him from doing something and he wants to do it again, he will look at you if you are smiling or frowning, once he sees u are frowning, he smiles adorably and u cant help but laugh. I noticed that he already knows how to read the “eyes” (the Yoruba land mother’s eye *smile*), so he tries not to do what you say he shouldn’t do. He is just 13months old. Most time its not about beating, you can correct a child even just with a look and you child will understand, that is if you communicate with that child often. instagram handle @honeyposh1. I have the most amazing 8 month old ever, permt me to say that. Though he has not started talking he is hilarious. firstly he wakes up in the morning and completely ignores his dad cause he knows he is not getting any food there, when he is done he goes over to him and gives him a toothless smile, now that’s genius. We went for his medicals recently and the doctor made an attempt to remove his cloth, my son gave him a very stern look, all the nurses joked that the doctor might receive a slap. His grandma took him out one day and she put some live chicken beside him thinking he is going to run only for my son to grab the chicken by the neck and attempt to kiss it. While we are not very fanatical about religion, I always try to filter the kind of music I listen to, the movies I watch etc while my son is around me. I try to preserve his innocence for as long as possible. So you can imagine my suprise when one day he came home from school and was singing “O sha pra pra”. I said to him “stop it, children of God don’t sing that.” He said “okay mummy” and sang some other songs. A few days later he came up to me and said “mummy, I want to sing sha pra pra”. I said no. He kept asking and I kept saying no till I finally gave in and told him to sing it. He sang “o sha pra pra!” … Just that one line, sung in the sweetest voice ever and he smiled with such deep satisfaction, I had to smile along with him. I’ve learnt that much as we try to shelter our children, we can’t keep them naive. They have to interact with the society around them. It’s up to us as parents to give them the tools to filter the external influences and stay strong to their beliefs and value system. My name is Ibiyemi, my son is Oyeleke. I’m not on instagram but can be found on twitter as @Aibeefash. My instagram handle is @pwettimama, my name is oby and my son’s name is Jedidiah or odun’leyachaba; my son is 2yrz and 5months very cute and smart. Anytime either me or his dad fart, he will just shout ” ummmm mimmi mess mess” embarrassing though even when we go out ooo… It shows there are some tinx which u are not suppose to do in ur kids front they learn very fast! Even when I was in labor during ma 2nd preg. He was awake all thru telling me mimmi showii u hear, so sweet of him i love u Jed. On Sunday which was the children day, I took my kids out to celebrate it with them. They were really happy cos they had lots of fun as they ate and danced as much as they before capping it up with dancing. On getting back home, I asked my son, 6 yrs old, what he would like to eat, and to my amazement, he replied with ‘but am fasting now I don’t want to eat anything’ and we all burst into laughter. So,he actually knew that there is fasting going on after taking all the food and drinks at the party. The moral of the story is that children are always conscious of what is going on around them even when they seem not to. My name is kikelomo, my son’s name is Al-ameen my instagram handle is kikkycrown. My son’s name is Uwana-abasi Bassey, my son just clocked exactly 2 on Children’s Day and I’ll love him to win this photoshoot as a gift from me to him. My son can’t speak so well, he’s still making efforts to but anytime I scold him for doing something wrong he sends me packing, lol…. He will be screaming “go go go” because I corrected him ooooo, see me see wahala, from my husband’s house, lol. I have got 2 beautiful kids.a 3yrs old girl and 11 month old boy.my son was sleeping one day and I know how long it took me to get him to sleep so I was tiptoing,whispering and almost ghostlike in every activity and also ensuring my daughter did same.she brought out her tab to play and I was like no you can’t do that yet.dont wake your brothershe sighed and went on to play with her leggoes.after some time that baby was deeply asleep,I received a call and was actually laughing at what my sister on the other end was saying only for my 3 yr old to walk up furiously to shush me up .She was like in a loud whisper shush mommy u want to wake my brother.thay got me real good and I ended the call abruptly. I realise it’s not about do as I say alone,it should be do as I do as well because we should always lead by example.i learn from being with this little ones every time. I have 2 lovely kids.a 3yr old girl and 11months old boy.one day my son was sleeping and I know how long it took me to get him to sleep so I was like tiptoing,whispering and almost ghost like in all activity while ensuring my girl did same.she brought out her tab to play and I was like you can’t do that .dont wake your brother.she sighed and went on to play with her leggoes.after some time when baby was deeply asleep,I received a call and was laughing at what my sister on the other end was saying only for my 3yr old to walk up furiously to shush me.she was like mommy shush you will wake my brother.that got me.i ended the call abruptly because I realised it’s not just do as I say alone.its about do as I do as well.we should lead by example.i learn from this 2 little ones every day. if you give him anything outside he will collect it and give it straight to me, no matter what it is, at times he will look away. The good thing about this is if he grows with this attitude, he will curtail accepting stuffs from strangers that way also he will grow to be okay with what he has no matter or big or little. My daughter name is Oluwatoni Odubiyi, she will be four (4) August 1st 2018, She has two cousins that she’s very close to Iremide and Olaoluwa, anytime she refuses her food or medication, i always tell her Iremide and Olaoluwa are eating or taking their medication, immediately she opens her mouth and takes. So her cousin names are magical to her taking instruction. My daughter can bring out her school books 100 times that she wants to write, i mostly tell her to return her book so it doesn’t get torn. This particular day, after several times of bringing up her books i told her to return it, she then told me ‘Mummy, Iremide and Olaoluwa are doing their homework now o” i busted into laughter. She said it so innocently and i said you’ve won this time and i had to allow her access to her books. The moral is, we should allow them be and not start comparing them to other children. My name is Mercy Amirize. My Son’s name is Chibuchi Amirize. Me: Bubu oya wish me happy mothers’ day naww?? Bubu: No you are not a mother ? Me: watt!!!?? ?what do you mean? Bubu: you are not a mother, you are a mummy?????? But sincerely I have been wondering why the little boy thinks am not a mother ….maybe He feels anyone that looks older, ties wrapper and cautions them firmly is a mother? While anyone that wears skimpy dress, makes up, plays with him ,looks younger is a mummy??…. But whatever be the case I know one day he will understand better?? Me: Ok.. what’s your name? Me: I can’t hear youuuuuu? Learning point for me is just to love and cherish these beautiful moments of joy, purity & laughter? Awwwww lovely stories. My ovaries don jump for joy tire. Can’t wait to have mine as well. Soon Gods willing ?????. Also, to women who Are currently praying for the fruit of the womb may God make it happen for you all. Be rooted in him(faith). Good luck y’all!!! Me: (shouts mildly & tickles her) I can’t hear youuuuuuuu? Shindy: (laughing hysterically) Shinyaaaaayaaaaaaaaaa :):):)? So I have a three years old daughter. Her name is Toki. On this particular day i did laundry and i was sorting out the clothes. I kept putting things in their respective places and she wanted to assist me but I turned down her offer. She asked why? I simply told her she’s not smart enough to do it. Minutes later we had a visitor, so I quickly did my sorting and mistakenly kept my bra in her drawer compartment. I got in with the visitor who was a male, we got talking, way into our discussion my daughter screamed from the room running towards the parlor. Upon her arrival she said “mommy come and take your breast from my drawer! That is not where your breast should be!! Mommy is not smart. I was embarrassed, I couldn’t even explain it to my guest he looked more embarrassed self. Latter that night I taught her the difference between bra and breast (hopefully she has gotten it). On another occasion, I was breastfeeding her younger brother who is 7months old. We had a guest and after exchanging pleasantries with my hubby, they went on to greet her and ask after her mom. My daughter response:- mommy is inside the room. Guest:- what is she doing, tell her we are around. My daughter response:- Torera (her younger brother) is eating mommy. Mommy can’t come out. It was spooking at the same time hilarious. Lessons:- I learnt never to underestimate children’s ability to learn and understand things. I began to teach her earnestly every words and vocabulary, explained necessary things to her and lastly often answer all her questions quickly and in details. My mistakes before was, I always ignored her whenever she asked questions or sparingly explained things to her because I felt she couldn’t comprehend it or its not necessary. My daughter name is :- Toki. My son is 3months old and I am a first time parent. It is a beautiful feeling being a parent. My experience in parenting so far. There are times when he’s awake and I almost feel frustrated and all I want is for him to just go to sleep and when he is asleep, I would go to his crib and stand there looking at him and I will be missing him and would want for him to wake up so I can hold him again. Lesson learnt: no matter how weird I feel or how much rest I desire, I can’t stay away from my baby.